BCDB Rating: 4.7/5 Stars from 15 users. This page has been viewed 38 times this month, and 8112 times total. Cartoon Characters: Jack Skellington, Sally, Lock, Shock, Barrel, Dr. Finklestein, Mayor, Oogie Boogie, Santa, Clown with Tearaway Face. Produced By Tim Burton, Denise Di Novi, Kathleen Gavin, Danny Elfman, Jill Jacobs, Diane Minter, Philip Lofaro. Written By Caroline Thompson, Michael McDowell, Tim Burton. Awards: Golden Globe Award Nominee, Best Original Score, 1994. Originally Released on October 29, 1993. "Tim Burton's Nightmare Before Christmas." You can watch this cartoon today on your computer. 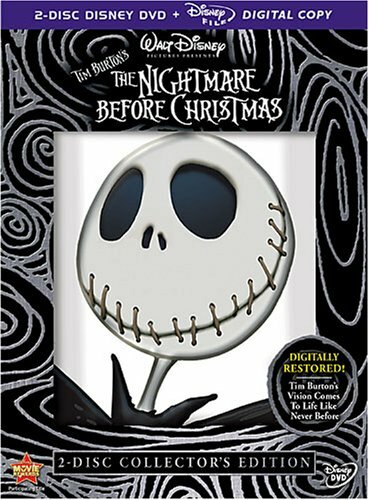 Just click below to start viewing "The Nightmare Before Christmas" online now. Do you have anything to add to this page? Have we made any mistakes... or do you have any additional information about The Nightmare Before Christmas? If so, we would love to hear from you. Please send us a quick note with your additions or corrections to this page, and we will make the corrections as soon as possible! Below are comments about this cartoon submitted by people who have seen this show. Take a look and see what others have said about The Nightmare Before Christmas. We want to know what you think, too!! Feel free to share your own opinion- we do want to hear from you! You can add your own comments here. Hi! I hope that, last night, you've all enjoyed going out in your costumes and wreaking havoc in the night. As for myself, I had to put up with staying home & not deal with a whole generation that grew up watching this. The Nightmare Before Christmas by Big Cartoon DataBase is licensed under a Creative Commons Attribution-NonCommercial-ShareAlike 4.0 International License.